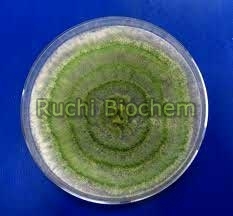 Trichoderma Viride Fungicide is an eco-friendly biological fungicide containing spores and conidia of Mycoparasitic Fungi Trichoderma Viride, having 2 X 108 colony forming units (CFU) per gram. Trichoderma when introduced along with seeds or at root zone protect the seedlings from attack by soil borne pathogens that cause root / collar / stem rots, wilts, damping offs, leaf blights spots etc. and promote healthy growth in early stages of crop. Vigorous growth of biological Trichoderma Viride Fungicide overshadows the pathogenic fungi, which are overpowered and prevented from infecting the plants. Before pathogens attempt infection via germinating seeds or roots they can be suppressed and controlled by various methods. Mycoparasitism, Antibiosis, Competition for nutrients or space, Tolerance to stress through enhanced root and plant development, Solubilization and sequestration of inorganic nutrients, induced resistance Inactivation of the pathogens enzymes by secreting certain plant growth stimulating substance.